The sweet juicy goodness of plums is concentrated in this delightful cake. Heat oven to 375 degrees F. Spray a 9" round cake pan with cooking spray. add the sifted dry ingredients to the egg mixture and continue beating until fully incorporated. Fold in the lemon zest and pour the cake batter into the prepared baking pan. Prepare the topping by mixing together the ground almonds, honey and coconut oil; it should resemble a coarse streusel. 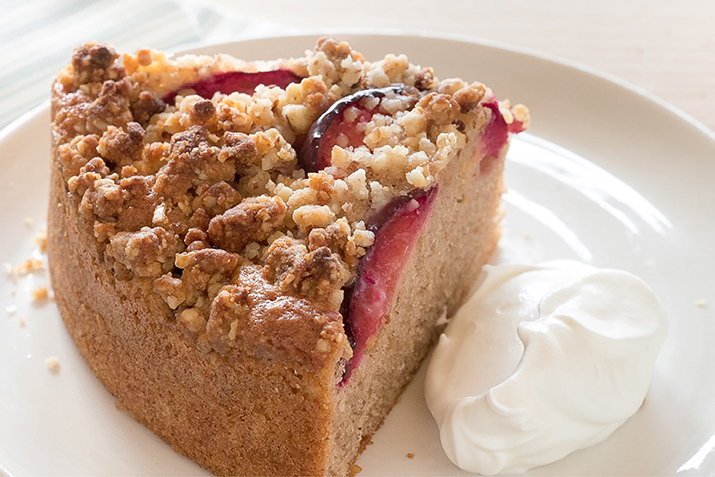 Lay the sliced plums on top of the cake batter, and top with the almond streusel. Bake for 25 to 30 minutes or until a toothpick inserted in the center of the cake comes out clean. Serve this dairy-free treat warm with a scoop of coconut sorbet. Cut in 2-inch squares and wrap in plastic wrap for a special lunchbox treat!